Prison Camp's premier wall features hard sport and traditional lines on slightly overhung water-polished stone. While the routes are a short fifty feet they tend to be full value. 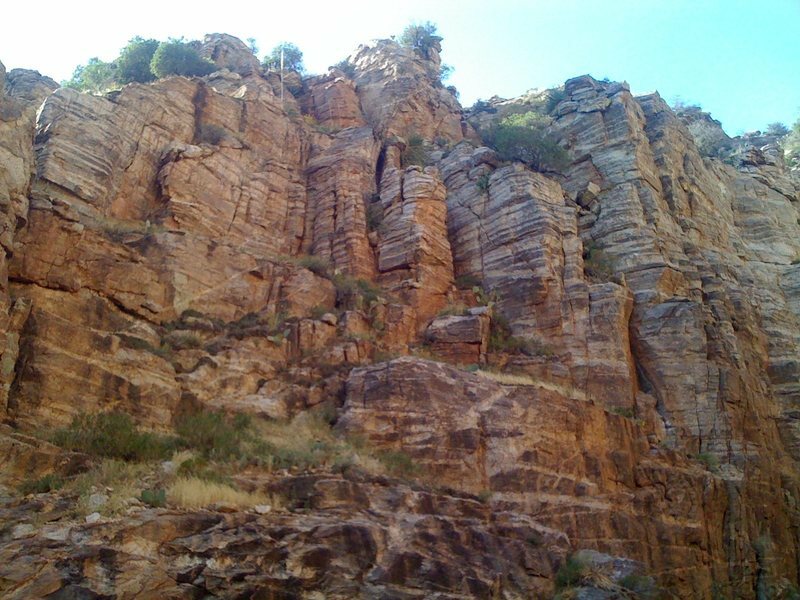 The slippery nature of the rock, powerful initial moves, and sometimes sporty bolting may be off-putting to some; nevertheless, this unique wall should not be missed by those climbing at the grade. Due to its northeast orientation and breezy dry riverbed location this wall is surprisingly chilly in the winter. In the winter this wall sees only an hour or two of morning sun. The best time to project these routes is spring and fall afternoons. Petty Theft, Grand Theft Otto, and Cold Hand Luke are found at the left end of Jailhouse Rock. 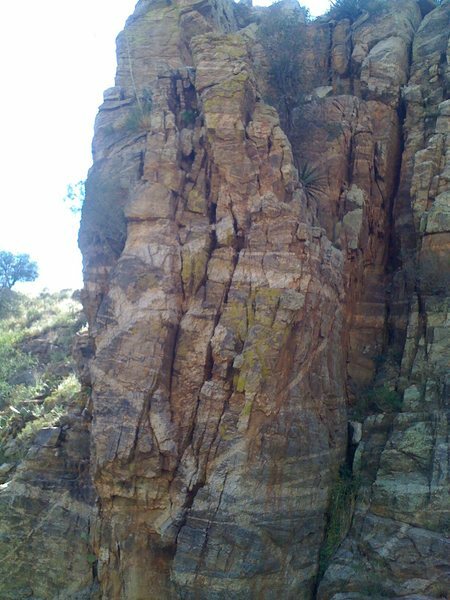 The rock is vertical to less-than-vertical and not as water polished. Hard Time and Assault With Battery are actually not part of Jailhouse Rock proper but are further downstream and south facing. These two routes receive all-day sun. Follow the dry riverbed past the Dragon Tower and Guard Tower. When you reach the Cell Blocks bypass the riverbed drop-off by travelling either to the left or right. Moving up and left past the Mr. Meanor Wall will lead you to the base of the sector; Moving up and right provides toprope access to many of the anchors. 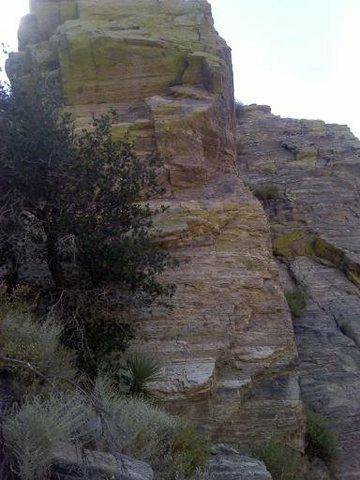 If you choose to toprope yield to lead climbers, watch for people below, and be careful setting up anchors. Gotta love the waterfall sounds as you climb! This wall is the reason to come here. Any word on the route name and rating corrections? Found a nice New Balance shoe in the wash. Brand new, couldn't find the other one. If it's yours, PM me and I'll get it to you. I have to say I've contemplated posting for a bit now and as I see my name on so many of the climbs I'd like to leave a bit of info about what is in majorty, Ben Burnham's legacy to the climbing community. Ben isn't climbing all that much any more and I've had a litany of injuries but back when Ben and I put these climbs up which have my name, his name or both we were climbing both weekend days three weekends a month. It was the good life. Ben took me to Prison Camp, seemingly to us Jailhouse rock being the tough wall after the stream drops off for the second time, to help with an area he felt would add moderates to the mountain. It sure did. The cell blocks were the first to have me be a part of them, Ben had already put up two climbs on the Misdemeanor(Miss Demeanor, Mr Meaner) wall. We did them from the top down with a set of chains placed at the top and as I remember at least one set revised later to a lower location. The scramble up was not fun. The numbers on the climbs referred to their difficulty and only cell block six is all bolts, the other two taking some gear, or "mixed climbs". That is what in some way prompted me to write as I saw a party low on CB9 when the leader yelled out "are you sure this isn't a mixed climb?" From across the way I answered., it was. Ben and I next moved to the guard tower, the six on the left was there so I could do toprope laps on the 10b. Never thought much of the 9 on the right, seemed to lack aesthetics. Does anyone have a current Topo of the area? As best as I can figure the routes on the main wall from left to right are Solitary Refinement, Safe cracker, Yard Boss, Crime & Punishment, Armed Robbery, Climb Spree, Sentenced to Hang, Jail Break, Finger Prince, Prison Overcrowding. We found a pair of flip flops at Jailhouse Rock on Saturday April 3rd. Describe them and we will get them back to you. 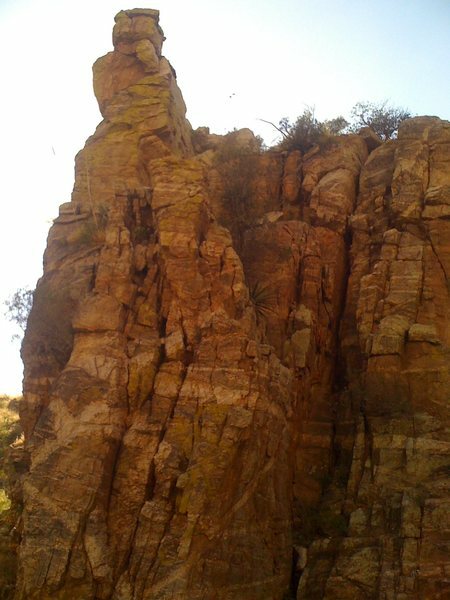 Was climbing this today and I don't know what it is. The tower in question photographed from upstream and across the wash. The 5.6/7ish potential trad route. The down-stream (south?) face of the tower in question. Potental for trad and/or sport routes? 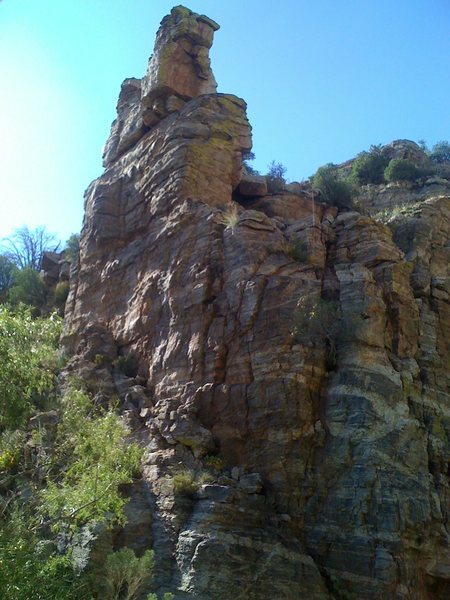 Shorter cliffs between the tower and the wall of 5.11/12's and "Petty Theft". For Nick Martel: Sorry was out of town and......haas it really been three years since I last posted?? Oh, well. About the Photos: from top to bottom. 1.Ben Burnham and possibly another put up routes on this and photo 2 which seems to be a different perspective of same. 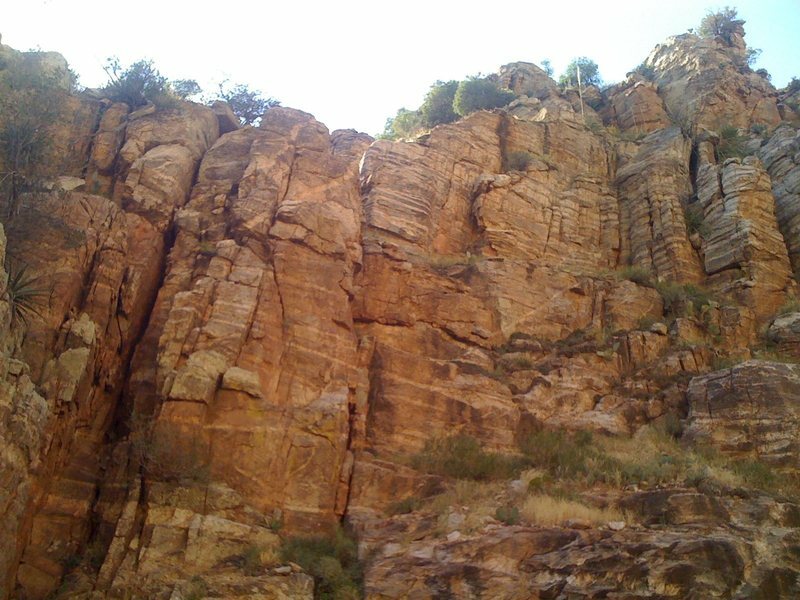 5.7-5.8 trad, I climbed these only one day but remember a pair of chains in a cleft at the top. To the right out of the picture of 1 is Cold Hand Luke. This put up as the routes to the left in the picture had already been put up. #.3 has a route right up the face one starts on the step moves right then up past a bolt. I don't think we ever named it(Ben and I) always known as the 10b. To the right of our route I understand a 10d was put up. I tried very hard before it was put up to toprope up, but beyond me. This wall is discussed on MP in the Jail House area. Now see if you can figure out the name. So...........the new Mussy Hooks are nice, I guess. I never had problem with the chains. I guess cutting seconds off of your top rope transfer could be nice if you really got to get those pitches in though. While guiding today I took down two sets today that were placed up there with carabiners that were taped closed with athletic tape?? These were on the Alcatraz Wall. I am not trying to be a jerk to anyone who is going to replace hardware at our local crags, but let's try not to ghetto rig the anchors. How much did the Mussy hooks cost? If you must have them then how much are the quick links that would make this a much safer setup? Sorry you don't like the Mussy hooks. I like the convenience of them, but I also like the safety factor of people not having to untie at the top of every climb to lower off. If you are climbing with a beginner and lead a route you either have to run the rope through the chains and top rope off that,(Bad form) or hope your new second can remember how to tie a new figure eight safely. On harder routes where there aren't many beginners, I figure if Lynn Hill can forget to tie in correctly to her harness and take a 70 ft grounder it could happen to anyone. My understanding of the routes. Hope it helps.